My oldest memory of moog'er daal is of Didin perched on her stool in her kitchen at her electric heater stirring moog'er daal or moong daal in a large shining iron kadai. The clinging sound of the 'khunti' and the swish of the daal as she leaned over the table stirring continuously was a common occurrence in the mornings as she prepped for the day's breakfast and lunch. Didin didn't cook a wide variety of dishes nor did she make special festive foods to mark the different 'parbon' that came by every month. She didn't observe fasts on the shastis and ekadashis either. The Hindu calendar was not a big part of our lives in Kolkata or in Mumbai as Moni didn't follow any of this either. But she cooked for us every day and we looked forward to our visits to her house for there would be a steady stream of everyday food tempered with special treats of mangsho'r jhol, machh'er chop, khichuri and other delights. Though Didin had a frugal repertoire in the kitchen she fed us very well and we looked forward to our annual trips to Kolkata where we'd be pampered silly by Didin, and all the mamas and mashis - my mother's siblings and cousins. The smell of roasting moog daal is something most Bengalis will identify with - it is the smell of home, of Bengal, of grandmothers and mothers, of comfort and comfort food. The moog daal I saw at Didin's house was tiny in comparison with what I saw in Mumbai. 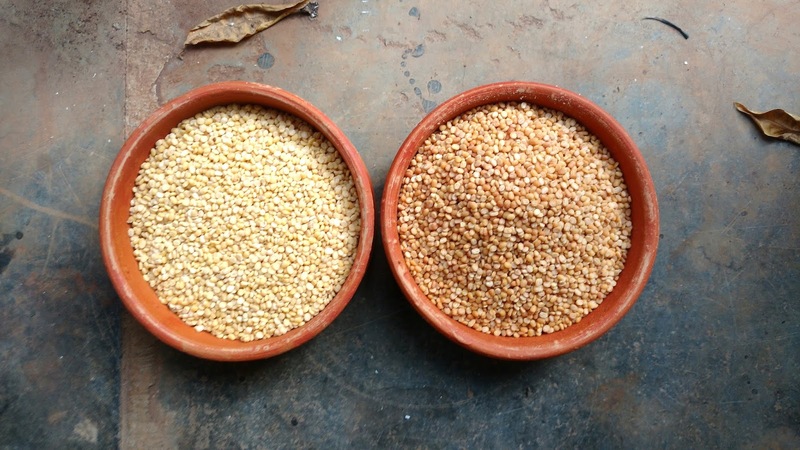 Each grain was the size of a pin head, so different from the longish grains I had seen in the shops in Mumbai. This is Sona Moog'er Daal, a variety that is grown in Bengal and is naturally, the preferred variety in Bengali kitchens. 40 years ago it wasn't available in Mumbai and there was only that much Moni could carry back from Kolkata when we visited. So we ate moog'er daal only in Didin's house, Moni rarely cooked it at home in Mumbai. 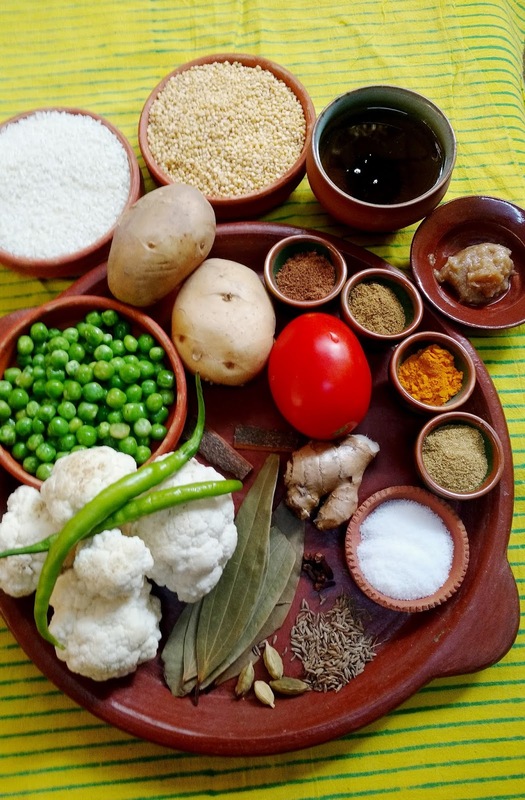 Nowadays it is far easier to find regional ingredients in Mumbai - not only do large supermarket chains carry good selections of regional ingredients, there are stand-alone shops that have a captive clientele for whom they source ingredients. That's not all - there are quite a few online stores that specialise in such products and deliver pan India. In Kharghar I am very fortunate to have Jambon Stores in Sector 20 which has transformed from being just another cold storage shop selling chicken, fish, cold cuts, frozen peas, etc., to a Bengali ingredients emporium where fresh stocks arrive every week by train from Bengal. And among all the wonderful products are varieties of rice and daal from Bengal including the beautiful small grained sona moog daal. One of the most popular dishes made with moog daal is khichuri. While khichuri is a must at the Durga Puja pandal bhogs, cooked without onions or garlic, and paired with a delicious mix vegetable preparation called labra, it also shows up on home menus depending on the season. The monsoon is deemed khichuri weather and in the first week when the rains have just arrived, while the rest of the world celebrates with chai and bhajias/pakoras, we Bengalis rub our hands in glee looking forward to a plate of steaming khichuri with a variety of bhajas on the side. Winter is also khichuri season but with beautiful winter vegetables adding their flavour - cauliflower, red carrots, green peas, potatoes are the top favourites in a "sheet kaal'er khichuri" or winter khichuri. Here's how to make it. Wash the rice and leave it in a fine mesh colander to drain. Roast the daal gently in a dry wok for around 10 minutes till the colour changes and there's a lovely toasty aroma. The daal should change from its pale yellow to a nutty brown. Roast it to a level you like, just ensure you don't burn it. Once roasted, wash the daal once, drain and set aside. Don't wash the daal very vigorously or repeatedly as you will lose all the lovely toasty aroma and flavour. Peel the potatoes and cut into cubes. Cut the cauliflower florets but not too small as they will then disintegrate into the khichuri. Peel the carrots an cut into thick barrels, if using. Shell the peas or thaw frozen peas. Peel the ginger and smash in your mortar and pestle till relatively smooth. This barely takes half a minute so use fresh. Wash and chop the tomato. Now in a thick bottomed vessel heat mustard oil. Once properly hot fry the potatoes, then the cauliflower and reserve on a plate. Fry the veggies till they brown a little. This frying helps keep them intact while they cook in the khichuri. In the same vessel add a little oil if required and then add the whole spices. Let them sizzle and then add the chopped tomato and the smashed ginger. Chuck in the green chillies, broken into 2-3 pieces depending on their size. Cook everything on a medium flame till the tomato has totally disintegrated and everything is mixed well. In a small bowl mix all the dry spices in a little water to make a runny paste. Add this to the pot, stir well and cook till the spices have lost their rawness and oil is released. Add the drained rice to the mix and saute for a few minutes. Then add the washed and drained bhaja moog'er daal or roasted moog daal. Mix everything well, add salt and enough water to cook the khichuri. Once the mix has come to a boil lower the heat and add potatoes. Cook covered on medium heat. Once the potatoes are half cooked add the cauliflower, peas, and carrots. Add a teaspoon or so of sugar at this stage. Cover the pot and let the khichuri cook. If you're using frozen peas add them at the end, in the last couple of minutes. make sure they are thawed properly before you chuck them in. Stir occasionally so it doesn't stick to the bottom of the vessel. Add warm water only if required. Cook slowly till done. Once the khichuri is cooked add a good dollop of ghee and a sprinkling of Bengali garam masala to the pot and stir it in. Taste for salt and adjust if needed. 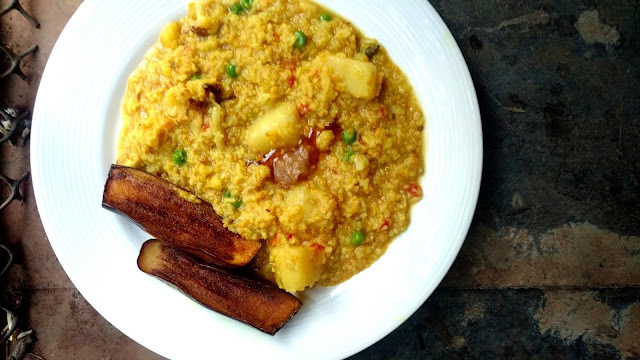 The khichuri should be thick and porridge-like, not dry. If you're vegan, leave out the ghee. You can serve this sheet kaal'er khichuri with begun bhaja, potol bhaja, or a simple omelette with onions and green chillies in it. A fried papor/papad will make it complete!